Often have I commented on the hazy “intertidal” zones found along the former borders of long forgotten town and village municipalities in Western Queens – in fact, I’ve coined the term “angles between” for them. 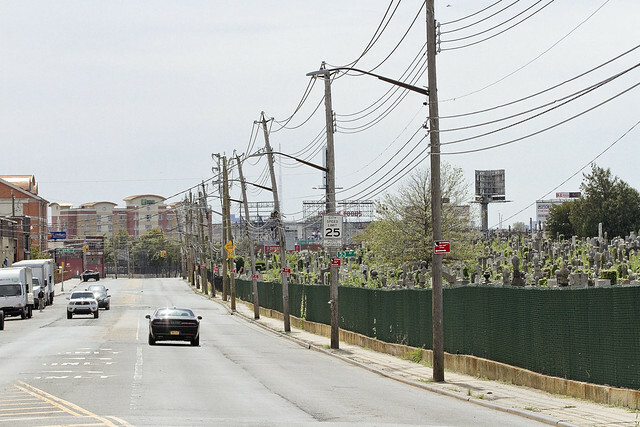 There’s – functionally – no one alive today who has a personal remembrance of Maspeth or Woodside being referred to as towns or villages with clearly defined borders due to urban sprawl and the life’s work of Robert Moses. 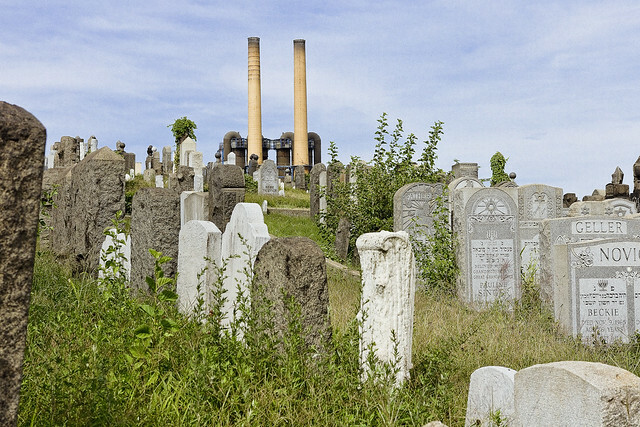 When the City of Greater New York consolidated Long Island City and the county of Newtown into a new entity called “Queens,” it’s at these hazy border areas that the Manhattan people got away with literal “bloody murder.” The export of Manhattan’s dirty industries, it’s unwanted poor, the corpses of its dead – all were sent east to what was – then – a still quite agricultural community called Queens. This also happened to the Bronx and Staten Island, and to a lesser degree Brooklyn. 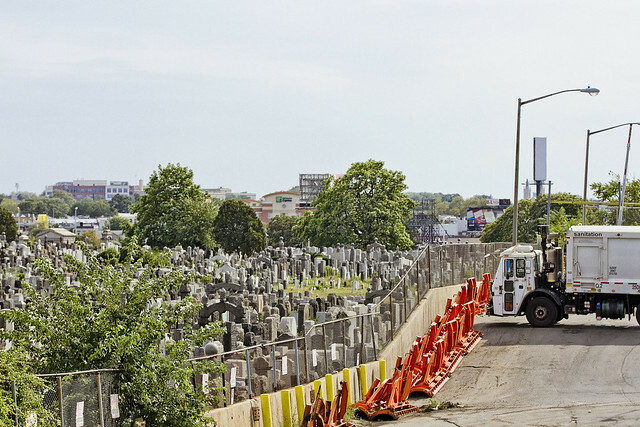 The local politicians in the “lesser” boroughs were more than happy to take on the cemeteries, heavy industries, and garbage handlers in the name of “progress” and doing favors for the hidden elites of Manhattan. 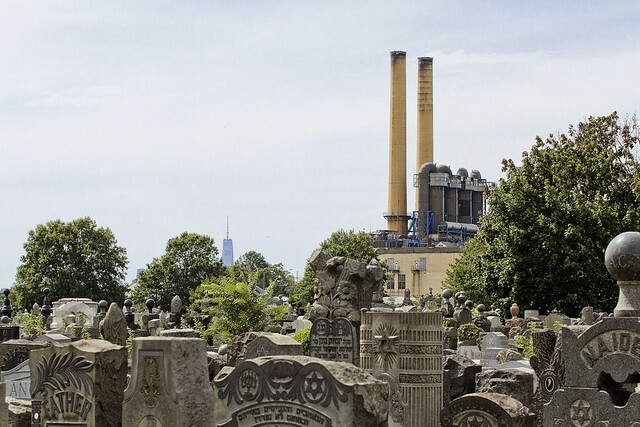 The Shining City of Manhattan replaced its tenements, its abattoirs, its manufactured gas plants with what at the time would have referred to as “modern” apartment blocks. For you real estate savvy types – that’s so called “pre war” developments like Tudor City in Murray Hill, Peter Cooper Town/Stuyvesant Village which sits on the former site of several Manufactured Gas Plants, or the United Nations building (built into the former site of several slaughterhouses and abattoirs that was known as “blood alley”). The process of converting industrial Manhattan over to a residential and commercial center kicked into high gear in the years before and directly following the Second World War, the age of “urban renewal.” That’s when the highways were jammed through on Long Island, the dairy farms of Queens were converted to housing tracts, and the “Manhattancentric” school of thought concerning development really kicked in. The tenements emptied as the teeming masses sought a better life in Queens, and further east in suburban Nassau and Suffolk counties. This turned Western Queens into a transit corridor for trade and commuters. It’s all about “the City” and literally all roads for hundreds of miles in any direction lead to Manhattan. Mt. 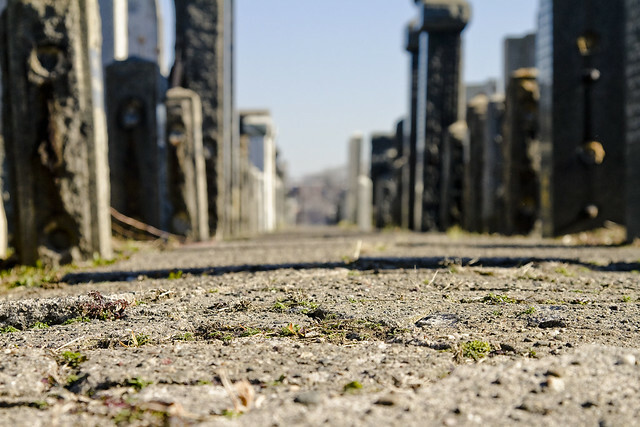 Zion cemetery – that’s its Maurice Avenue fence line pictured above and it’s in the center of all the shots in today’s post – is categorically in Maspeth, and it is infested with tiny gecko like lizards. Saying that, it also defines Maspeth’s blurry border with Woodside in the same way that Maspeth’s border with LIC’s Blissville section is defined by the Koscisuzcko Bridge. 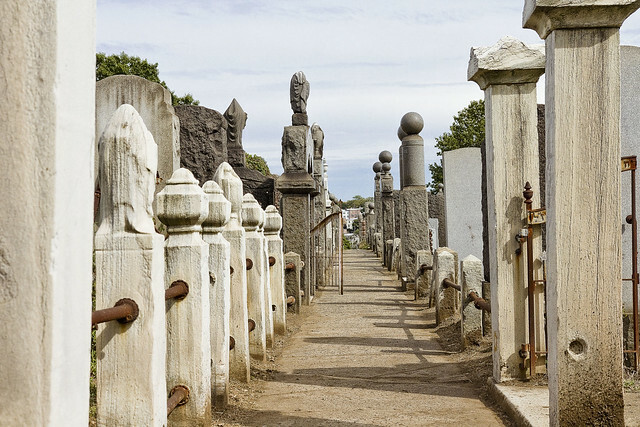 The cemetery is fairly ancient by Queens’s standard, it’s roughly 78 acres in size, there’s around 210,000 interments therein, and its first burial in Mt. Zion was conducted in 1893. There used to be a Gypsy encampment here, a shanty town that was home to a Romani tribe from Transylvania that called itself the “Rudari,” or “Ludar,” depending on whom you ask. The Rudari, just for the sake of literary trivia, are the same tribe that worked for Count Dracula in the Bram Stoker novel named for the vampire lord. 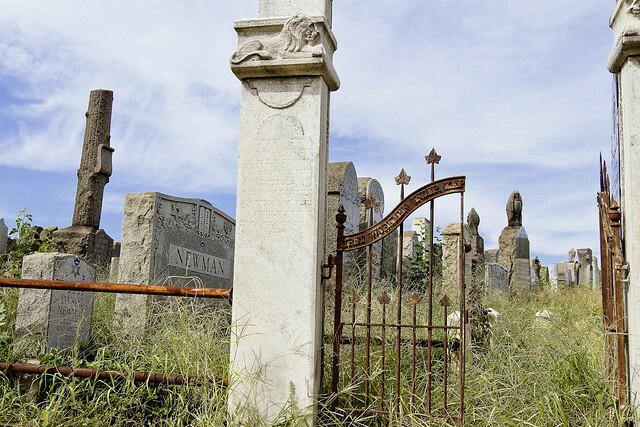 The historical record of Queens usually refers to them as “The Maspeth Gypsy’s,” and it should be mentioned that referring to them using such nomenclature would be considered a racist hate crime and slur in the modern day European Union. The Rudari were renowned for copper working and animal training. The reason that the circus train still comes to Western Queens every year is that the circus industry used to buy trained critters – bears, horses, etc. – from them. 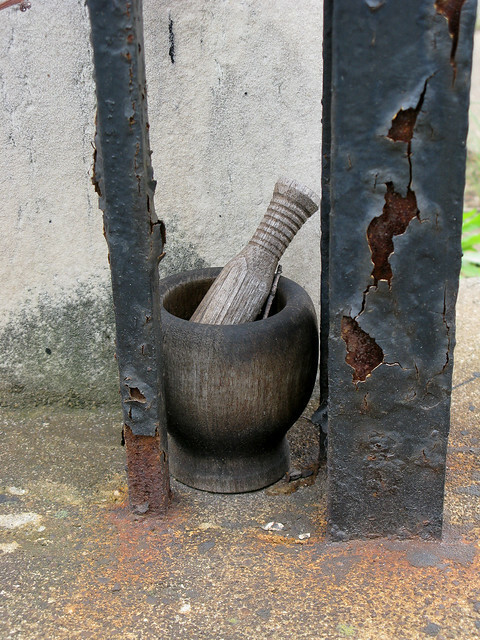 Many Rudari found work at the Phelps Dodge copper refinery along Newtown Creek, and remnants of their community persist to this day in the Sunnyside Gardens area along Queens Blvd. There are a series of semi detached one and two story homes in the area directly surrounding Mt. 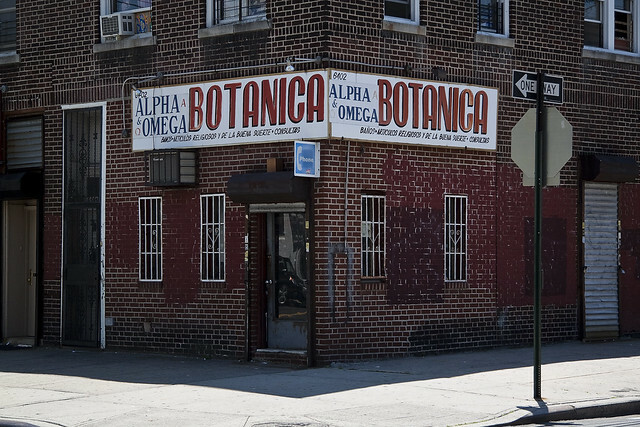 Zion, which are sandwiched between the Long Island Expressway and Brooklyn Queens Expressway. To the south is the heavy manufacturing district surrounding the eastern side of Newtown Creek and its tributary Maspeth Creek. Mixed use industrial zoning directly touches the cemetery, and hundreds of truck based warehouse businesses are located hereabouts. There is also a large footprint Coca Cola distribution center nearby, and a primary shipping hub for United Parcel Service is less than a mile away, as is the warehouse and distribution center for the Duane Reade retail empire. Mt. 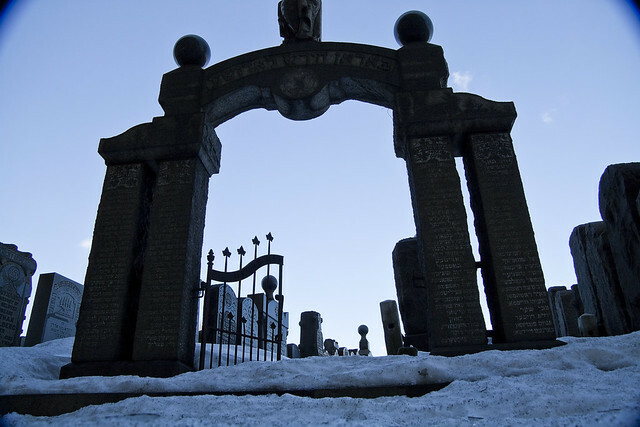 Zion’s western side is directly across the street from the Second, Third, and Fourth sections of Calvary Cemetery. Pictured in the first shot of today’s post is part of the Department of Sanitation’s colossal vehicle maintenance facility, which is right next door to an NYPD vehicle maintenance facility, and there’s an FDNY vehicle maintenance facility nearby as well. Suffice to say that these are heavily travelled streets, here under the Long Island Expressway and just a short walk away from Newtown Creek. If you talk to the people who live anywhere near this area, their common complaint always involves the amount of trucks and cars which use their neighborhood as a thoroughfare. Of course, talking to the people of Queens is considered an obstacle by City Hall, and a loathsome requirement when implementing their policies. Mt. 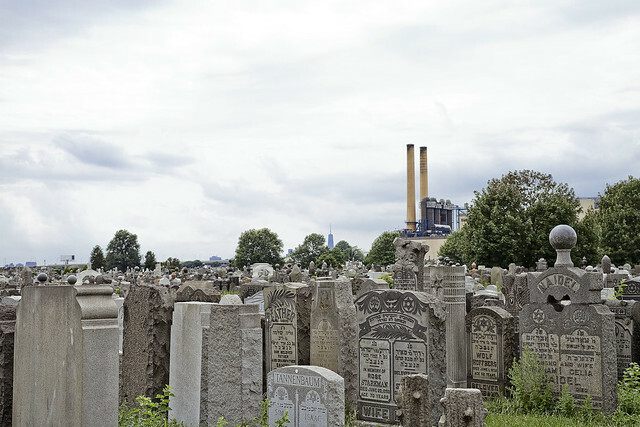 Zion cemetery was set up for members of the Jewish community, whose burial laws are a bit different than the Catholic ones. 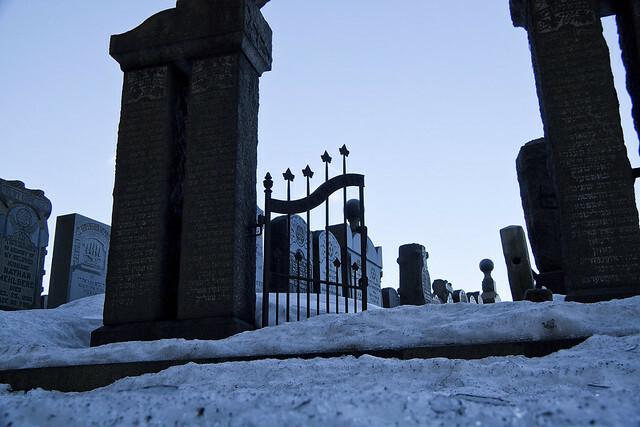 Jews are meant to buried singularly, rather than having multiple bodies in the same gravesite as in the Catholic tradition. This means that Mt. Zion sprawls and has the appearance of being overcrowded. 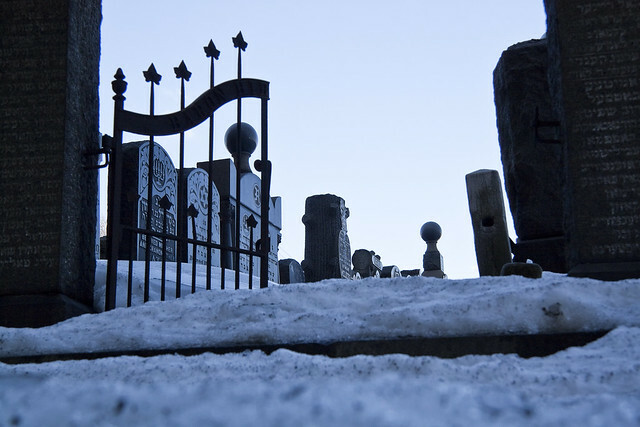 There are sections of the cemetery which are virtually impassable due to this, where it is impossible to find a place to put your foot down between the rows of tombstones. 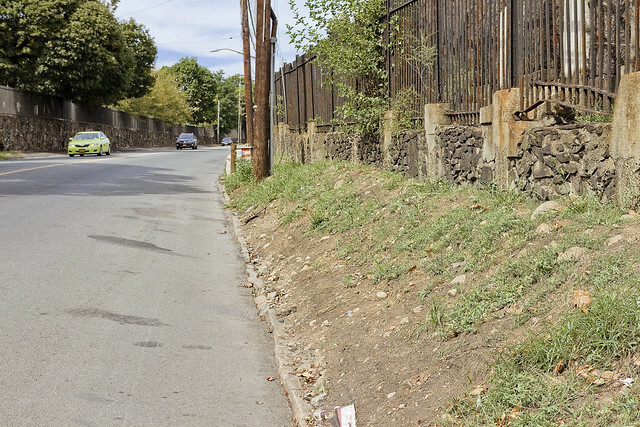 The streets surrounding it are barren, virtually treeless, and are a favored spot for illegal dumping of construction debris and other garbage. My personal views on the Maspeth shelter project were the subject of a debate recently with a former colleague whose views and perspectives I greatly respect, but the argument I make about the placement of people – people who exist at the lowest end of the socio-economic spectrum – in this area is that it’s a human rights violation. Simply put, it ain’t exactly a bed of salubrious roses out around these parts even if you’ve got money in your pocket, let alone when you’re down and out. This wouldn’t be a shelter, this would be a penal colony. Maspeth, as in the community of, has been doing a great job of demonstrating its objections to the placement of a homeless shelter hereabouts. They don’t need me to chime in, or make war, for them. What I’ve found disturbing is that the knee jerk reportage mentioned above that describes their objections in terms of “rich white people” not wanting “poor black people” in their neighborhood – which has been presented by news sites that have covered the protests. 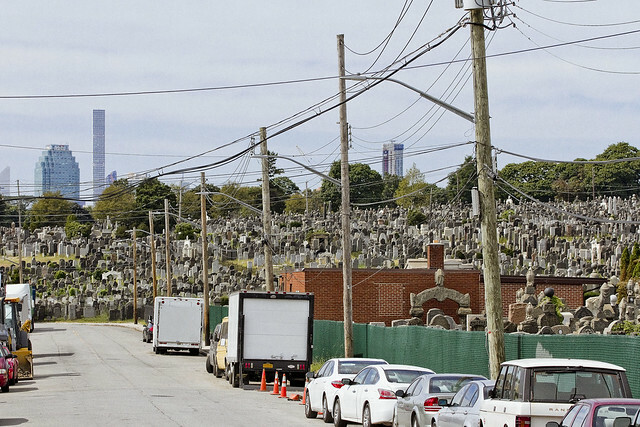 To start, there’s a few different sides to Maspeth. To the south and east, you do indeed have a somewhat suburban and moneyed section that is populated by people of European decent. To the south and west you’ve got an industrial zone, but you’ll find the odd block of homes in there, the residents of which are a hodge podge of “everybody.” On the north western side, here around Mt. Zion, my observations have revealed a population who are pretty much the same mix of people you see everywhere in Woodside, Sunnyside, Astoria and so on. East and Southeast Asians, Africans and African Americans, Irish, Jews, Italians, Levantines, Middle Easterners – the whole “vibrant diversity” mix that the politicians are always crowing about. The “homeless” are not a monolithic people comprised from a single racial group with a common ancestor. Who these “homeless” are would be best defined, by Marxist economists, as the “underclass” and what they have in common is not the color of their skin but grinding poverty. I’ve always argued that just calling these people “the homeless” is dehumanizing and that it’s done by those armchair academics who have never actually known someone living on the street in any context other than dropping a quarter in their cup. There is no “homeless problem,” rather there’s tens of thousands of individual problems. Siting them away from a familiar setting, breaking whatever they have left of a social network, treating them like something to be warehoused in a neighborhood of warehouses – this ain’t the right idea. 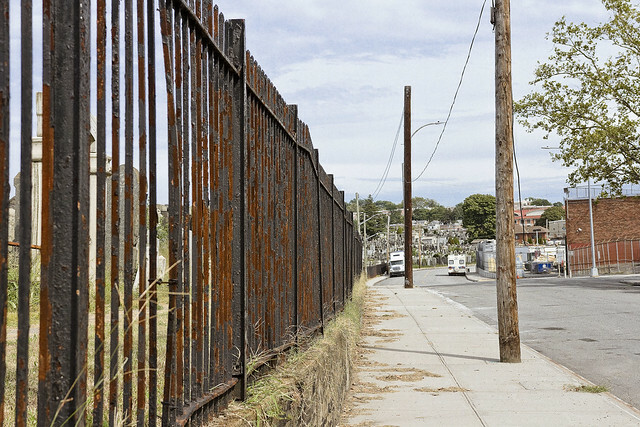 On the subject of every neighborhood having to do “its fair share” – Maspeth already handles close to 20% of NYC’s garbage, it hosts the LIE and BQE, has several NYS and one Federal Superfund sites in it, and there are intersections where close to 3-400 heavy trucks an hour roll through on their way to Manhattan. The garbage train also transits through Maspeth a few times a day, which represents and comingles Brooklyn’s share of the garbage handling with Maspeth’s. There are virtually no mass transit lines available from this location, police patrols are infrequent at best, and at night this is a virtually abandoned part of the city. Bus service is spotty, and it’s one of the places in Queens where you truly need a personal vehicle to get around. There are streets with no sidewalks here in the half mile around the proposed shelter. The shocking ignorance of City Hall regarding the existential realities of Western Queens never fails to amaze me. All they seem to know about our neighborhoods is what they see on maps rolled out on mahogany desktops that have pins stuck into them by paid cronies. I’ve met several members of the Dept. of City Planning over the years, and the ones who I respect the hell out of are the ones who put on a pair of sneakers periodically and go out for walks in the areas they’re assigned to. I don’t always agree with their choices, but I do respect them. I have a random idea, which is to site a homeless shelter on 11th street in Park Slope, just off fifth avenue. Tomorrow, we’ll cross under the highway and take a direct look at what Mayor Bill De Blasio considers as being a good fit for one of the most vulnerable populations of people in NYC to call their temporary home, since he hasn’t decided to lead by example and convert his aforementioned house on Park Slope’s 11th street over to either affordable housing or for use as a shelter. Something about the centennial mark of the “fin de siécle” made one think about Mt. 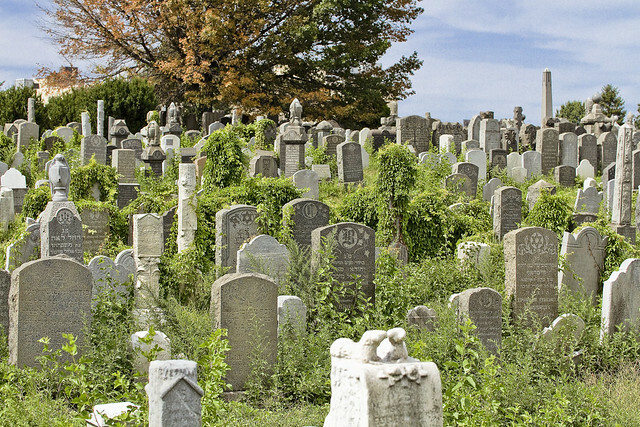 Zion cemetery, which is pictured in today’s post. The term refers to the end of the 19th century in its literal interpretation, but broader usage of “fin de siécle” is meant to imply the sense of doom which the late 19th century’s artists and academics expressed. They knew it was coming, the end of the age, an apocalypse. There’s interpretation and intuition being offered everywhere online today about the century marker for the First World War’s official start. There’s the version of the story which talks about all the war dead, the one where the United States became “America!! !” because of the conflict, and the chestnut about the decline of the European peninsula from its former status as the center of colonial supremacy. The antichrist appeared in Russia, and he raised a godless rogue state from the ashes of the Tsarist form of government. Personally, I’ve always ascribed to the concept of the “Second Thirty Years War” when describing the state of world affairs between 1914 and 1945, but that period is less “fin de siécle” and more “birth pangs of the modern era,” from our perspective. We know how the story comes out. The First World War was actually a war of industrial bases when you think about it. Vast international death machines require long logistical supply lines, or so I am told, many of which stretched all the back to my beloved Newtown Creek oddly enough. 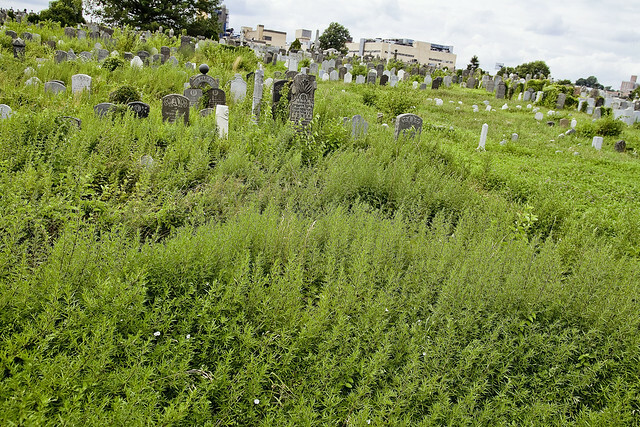 Given my particular love of the industrial sectors of LIC and Greenpoint surrounding the waterway, which were at their height during WW1, I try to only think of cemeteries when considering the conflict. Keeps me even, and helps hint at why Granpa Alex didn’t ever want to talk about the war. Don’t miss the Hunter’s Point Avenue Bridge Centennial tomorrow, on December 11th, a free event. For more on the HPA Bridge Centennial, click here. Also, please consider purchasing a copy of the first Newtown Pentacle book: “Newtown Creek for the Vulgarly Curious” – a fully annotated 68 page, full-color journey from the mouth of Newtown Creek at the East River all the way back to the heart of darkness at English Kills, with photos and text by Mitch Waxman. Original title Al Azif — azif being the word used by Arabs to designate that nocturnal sound (made by insects) suppos’d to be the howling of daemons. Composed by Abdul Alhazred, a mad poet of Sanaá, in Yemen, who is said to have flourished during the period of the Ommiade caliphs, circa 700 A.D. He visited the ruins of Babylon and the subterranean secrets of Memphis and spent ten years alone in the great southern desert of Arabia — the Roba el Khaliyeh or “Empty Space” of the ancients — and “Dahna” or “Crimson” desert of the modern Arabs, which is held to be inhabited by protective evil spirits and monsters of death. Of this desert many strange and unbelievable marvels are told by those who pretend to have penetrated it. In his last years Alhazred dwelt in Damascus, where the Necronomicon (Al Azif) was written, and of his final death or disappearance (738 A.D.) many terrible and conflicting things are told. He is said by Ebn Khallikan (12th cent. biographer) to have been seized by an invisible monster in broad daylight and devoured horribly before a large number of fright-frozen witnesses. Of his madness many things are told. He claimed to have seen fabulous Irem, or City of Pillars, and to have found beneath the ruins of a certain nameless desert town the shocking annals and secrets of a race older than mankind. He was only an indifferent Moslem, worshipping unknown entities whom he called Yog-Sothoth and Cthulhu. In A.D. 950 the Azif, which had gained a considerable tho’ surreptitious circulation amongst the philosophers of the age, was secretly translated into Greek by Theodorus Philetas of Constantinople under the title Necronomicon. For a century it impelled certain experimenters to terrible attempts, when it was suppressed and burnt by the patriarch Michael. After this it is only heard of furtively, but (1228) Olaus Wormius made a Latin translation later in the Middle Ages, and the Latin text was printed twice — once in the fifteenth century in black-letter (evidently in Germany) and once in the seventeenth (prob. Spanish) — both editions being without identifying marks, and located as to time and place by internal typographical evidence only. The work both Latin and Greek was banned by Pope Gregory IX in 1232, shortly after its Latin translation, which called attention to it. The Arabic original was lost as early as Wormius’ time, as indicated by his prefatory note; and no sight of the Greek copy — which was printed in Italy between 1500 and 1550 — has been reported since the burning of a certain Salem man’s library in 1692. An English translation made by Dr. Dee was never printed, and exists only in fragments recovered from the original manuscript. Of the Latin texts now existing one (15th cent.) is known to be in the British Museum under lock and key, while another (17th cent.) is in the Bibliothèque Nationale at Paris. A seventeenth-century edition is in the Widener Library at Harvard, and in the library of Miskatonic University at Arkham. Also in the library of the University of Buenos Aires. 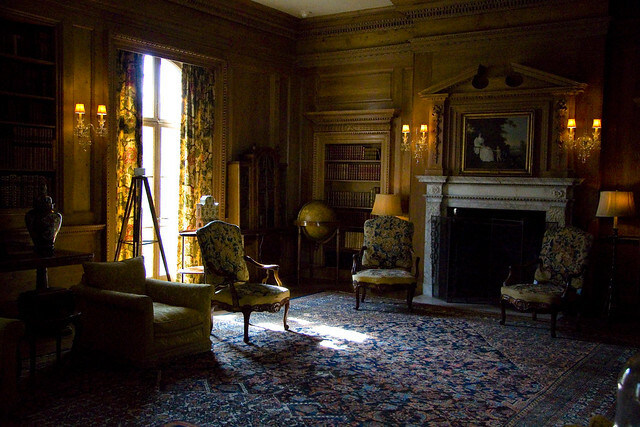 Numerous other copies probably exist in secret, and a fifteenth-century one is persistently rumoured to form part of the collection of a celebrated American millionaire. A still vaguer rumour credits the preservation of a sixteenth-century Greek text in the Salem family of Pickman; but if it was so preserved, it vanished with the artist R. U. Pickman, who disappeared early in 1926. The book is rigidly suppressed by the authorities of most countries, and by all branches of organised ecclesiasticism. Reading leads to terrible consequences. It was from rumours of this book (of which relatively few of the general public know) that Robert W. Chambers is said to have derived the idea of his early novel The King in Yellow.